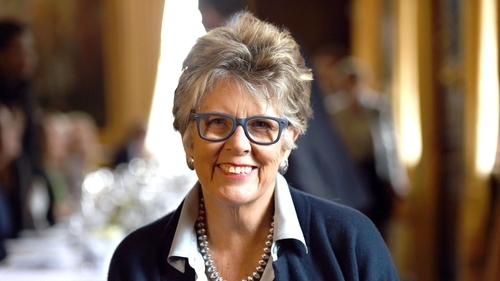 Prue Leith at 78: "I'm having a little revival in my old age"
Prue Leith had barely written a recipe in 25 years. For more than two decades, the culinary mind of the legendary Prue Leith – the woman who set up the prestigious Leiths Cookery School and London restaurant of the same name – lay pretty much dormant. And then she found herself appearing on the Great British Menu, replacing Mary Berry on the Great British Bake Off, and "pinching" recipes off the contestants. Telly provoked her interest in cooking again, and luckily she found a whole new audience interested right back at her. "When I stopped writing cookery books 25 years ago, half the people who are now watching Bake Off weren’t even alive," she notes dryly. These people, as well as faithful Leith fans, are fully catered for in her new cookbook, Prue: My All-time Favourite Recipes. Packed with classics like roast pork and cottage pie with black pudding, the South African cook is also sharing fresher, zingier dishes, like baked sea bass with samphire and cucumber, Colombian chicken, and potato soup and burrata with kumquats. It makes a change from the novels she’s been writing. "The last thing they wanted was a new novelist," she says of her publishers of 25 years ago. "What they wanted was a tried-and-tested cookery book writer who was very successful. The only way I could make them think, ‘Right, I’m now going to write novels’, was simply to refuse to write another recipe – which I did." An autobiography and eight novels down ("All quite successful, not, I must say, as successful as the cookbooks! "), on scrapping her self-imposed rule and returning to cookbooks, she says: "I’m 78 – I can do what I like now, haha." "I cooked everything at least once," she adds with a laugh, "but I didn’t have to cook it four times!" While Bake Off has encouraged her to start inventing recipes again, it’s also triggered a new interest in cakes. "I’ve never been much of a cake-maker," muses Leith, who’d only bake them on special occasions. "There wasn’t cake in the house like there was in my grandmother’s." But now there is: "John, my husband, gets quite: [shouting] ‘Where’s the cake?’ – ‘Well you make it!’" Her freezer is now usually stuffed with fruit cake or a lemon polenta ("so there’s always some cake for him"). She hasn’t managed to pass on her enthusiasm to fellow Bake Off presenter Noel Fielding though. "But Paul [Hollywood] has him making bread. I don’t know how many loaves he’s made, but he’s certainly made at least one." So Fielding is trying, then? "Well, Paul’s trying with him, whether Noel’s trying is another thing," she replies with a cackle. Leith is ever prepared with a quick comment or dry remark, however, her (somewhat accidental) catchphrase – "Is it worth the calories?" – might be one of her abiding principles, but it wasn’t meant to become her personal slogan. "I always judge things by, ‘I don’t care how many calories it’s got, it’s so delicious I’m going to eat it’, or, ‘It’s a special occasion, it’s worth the calories’. I won’t eat something which is high in calories and not particularly wonderful, because that’s just not worth it, you feel guilty after," she explains, adding: "Now I hardly ever say it because I feel self-conscious!" Talking of guilt and food, she admits she’ll occasionally diet "because I get too fat!" But that ‘diet’ – more of a rebalancing, really – consists of "laying off the booze and too much food", while the deep-seated association of guilt with food, she says, is "really dangerous". "All this worry about clean gut and stuff just makes people nervous about what’s going in their mouths," says Leith. "It’s such a boring thing to say but it’s the absolute truth, that the answer to a healthy lifestyle is moderation. Even people who are fanatic runners and run millions of miles, they’re the ones in old age who are so crippled with arthritis they can barely move – too much exercise is as bad as no exercise, and too much food is as bad as no food." There have been developments around eating and cooking over the past few decades that she does find encouraging though: "There’s much more interest in food now because of television mostly," she notes. "One wants them to move from watching the telly to actually doing it." She believes TV is beginning to prod people to pick up a frying pan but is adamant there needs to be more focus on learning cookery skills at school, and more support for people who aren’t adept in the kitchen. "Life has got tougher and tougher for people on a real tight budget, so people who have never learnt to cook, who didn’t learn at school and their mothers didn’t cook, who have basically grown up on junk food, it’s really difficult for them to change unless someone will give them a hand," she says, "because if you can’t cook, you’re not going to risk your benefit money on something the children won’t eat because they’ve never seen it before." Endlessly practical and committed, Leith is a patron of the Chefs In Schools charity, which aims to get professional chefs into school classrooms, alongside her Bake Off role. "I have never managed to put my feet up, ever," she notes. "I’m having a little revival here in my old age, a kind of renaissance, it’s all very exciting." Prue: My All-time Favourite Recipes by Prue Leith, photography by David Loftus, is published by Bluebird, priced £25. Available now.